Situated snuggly in the downtown West Village of NYC is an upscale restaurant that attempts to capture, what I consider, to be (the true) Italy. With a two-hour wait (for anyone without a reservation) on Aug 27th 2010, this restaurant was packed.The entire downstairs layout of L’Artusi is positioned to best see the open kitchen where Gabriel Thompson, the head chef and owner, calmly shouts orders and adds final touches to the dishes ready to be served. The restaurant feels pleasantly packed with tables, a white marble bar and a gray/white striped ceiling. The upstairs dining room (which looks similar to the bottom one) is usually used for private events. The entire restaurant lets off a strong sense of confidence and elegance. The menu at L’Artusi is divided into 5 sections or columns, Crudo (raw dishes), Verdura (salads/vegetables), Pasta (pasta), Pesce (fish, cooked) and Carne (meats and chicken). From the Crudo column we choose to order the Dayboat Scallops ($15). As a ‘Verdura’ we order the Butter Lettuce ($12) and Heirloom Tomatoes ($15). Moving onto Pastas I immediately realize what this restaurant’s forte must be. Not only by the sheer number of pasta selections, but from the delicious looking and smelling dishes I am now seeing exiting Gabe’s open kitchen. So from here we pick Fettucine Nero ($19) and Tagliatelle ($18) to start. The next section is Pesce. 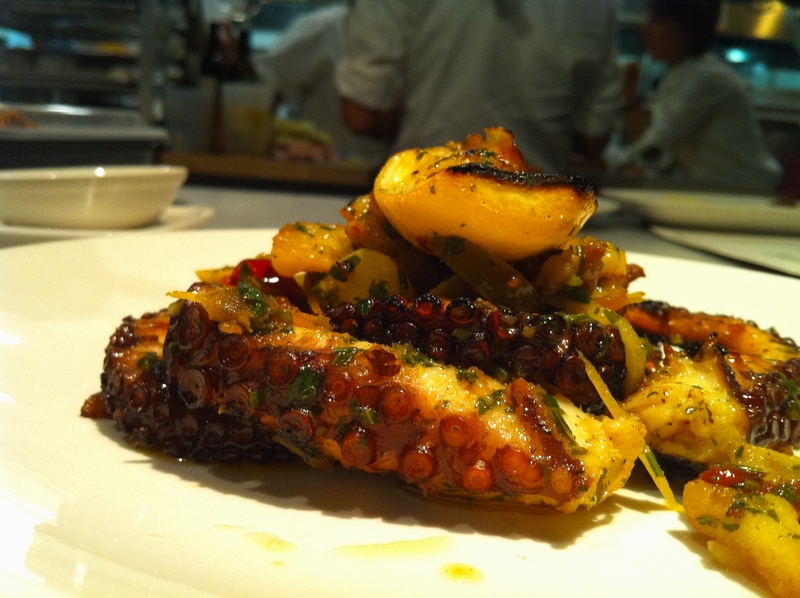 Octopus being one of my favorites, we order the Grilled Octopus ($15) and leave it at that for the time being. Finally, we reach the last section, Carne. From here we simply order the Hanger Steak ($22) based on a tip from our waitress. The first gruppo di alimenti presented to us was our ‘Crudo’ dish, the Dayboat Scallops. The dish was simple as it should be with thin strips of scallop dripped with lemon and topped with sea salt. The sweet fish was perfect, combined with the lemon, but the salt seemed to distract, and grab my attention leaving me a little overpowered and confused by the multiple flavors at play. Next to come was the Butter Lettuce. It was mediocre and overly soaked with dressing and cheese. Grilled Octopus was well, to say the least, grilled. I had mixed feelings about this dish. Some pieces were burned, tasteless and lost the unique taste octopus usually holds. Others were not overly charred and still held the taste of the sea. As if right on cue, the first of two pastas ordered, Fettucine Nero, came steaming to our table. 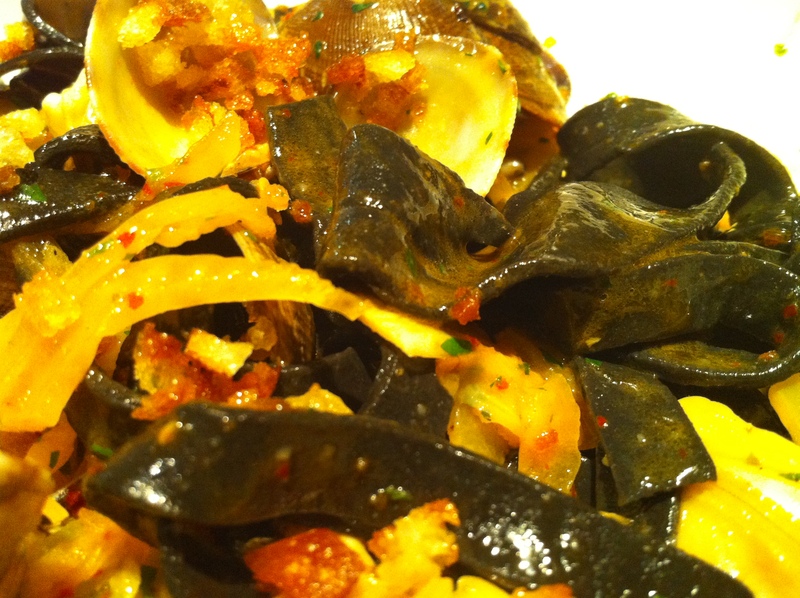 I was caught first by the sight of the squid ink pasta and small clams on top. It looked, to be frank, heavenly. (Note: I have a strong bias towards clams) The pasta was a perfect texture and the clams held their own among the spiciness of the overall dish. It was bold and arguably the most memorable part of our meal. The second pasta was the Tagliatelle mixed with “Bolognese bianco”. Combined with egg yolk and shaded a light green color it was thick and very traditional tagliatelle. The Bolognese added the right amount of push to the thick, wide and al dente pasta. It was crafted masterfully so that the bolognese wasn’t simply a ‘sloppy joe’ type of meat, but a much more elegant. After we had finished our pastas we were surprised to receive a light conclusion of Heirloom Tomatoes from the ‘Verdura’ section. The tomatoes were absolutely solid and brilliantly thought out. Combined with sweet watermelon and pancetta the flavors were ‘meant to be’ together. Dessert was simple. 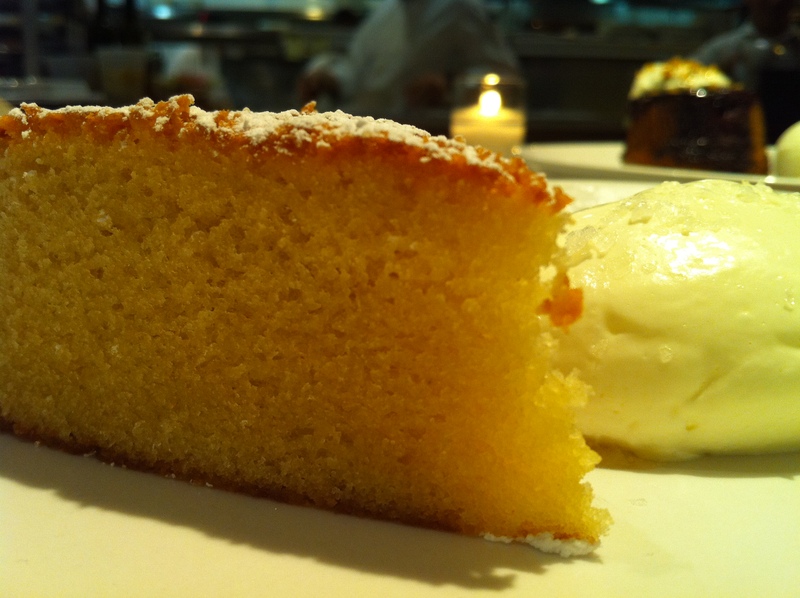 Olive oil cake made by Gabe’s wife, Katherine Thompson, herself a superb pastry chef. The cake was uniquely delicious. It was moist and clearly held the taste of olive oil. The care and time put into the recipe was apparent and we were hooked. It just was the conclusion a great meal needed. ~ by David Fishman on December 9, 2010.